Since we have short memories, let us return to 2003, a time when pundits wondered how many American troops might die in the Iraq War before the public rose up in protest. No one imagined that nearly 4,500 Americans would die in the course of the war, or that it would last so long. One of the early casualties was Pfc. Lori Piestawa. An hour before the ambush, Pfc. Lori Ann Piestewa knew something was wrong. It was just before dawn, only three days into the U.S. invasion of Iraq, and her unit’s slow-moving convoy was approaching a bridge over the Euphrates River. That’s when Piestewa saw it: the heavily fortified town of Nasiriyah, rising out of the sands like a mirage. She stared in disbelief through the dusty windshield of the Humvee she was driving. A city? Shouldn’t they be in the desert? At the far end of the bridge, Piestewa spotted an Iraqi military checkpoint. She braced for the worst. But as the column lumbered by, the Iraqi soldiers inside waved, beckoning the Americans deeper into the city. Piestewa turned to her best friend, Pfc. Jessica Lynch, who was riding in back of the Humvee. They were both thinking the same thing: We’re not supposed to be here. It was a small error, but a fatal one. The 507th Army Maintenance Company – a support unit of clerks, repairmen and cooks – had taken a wrong turn in the desert, stumbling into Nasiriyah by mistake. Without warning, the company suddenly found itself surrounded, an easy target for Iraqi soldiers and fedayeen paramilitary forces armed with AK-47s, mortars and rocket-propelled grenades. The ensuing attack proved to be the Army’s bloodiest day of the ground war – and the first hint of the deadly quagmire that Iraq would soon become. Eleven American soldiers were killed and nine were wounded when the 507th came under what the military later described as a “torrent of fire” in Nasiriyah. After a dramatic rescue, Pvt. Jessica Lynch returned home to a media blitz. 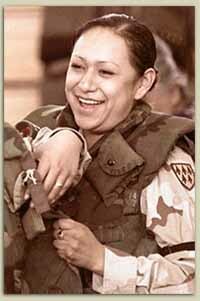 She was pressured to be the public face of the American soldier going down with guns blazing. Jessica Lynch turned down a chance to be a war celebrity, because she was accountable to her fellow soldiers, and to the truth. She served the American people with her integrity, as much as she did while in uniform. Lynch was badly injured when her convoy was ambushed in Iraq in 2003. She was later rescued by American troops from an Iraqi hospital, and the tale of her ambush was changed into a story of her heroic resistance. Although Lynch was injured severely, she didn’t suffer any gunshot wounds. Still, recovery is a long process and she said the healing is slow. Lynch, whose brother also serves in the Army, isn’t sure why the stories were made up because her capture occurred so early in the war. But she was the first POW rescue since World War II, which was big news. She wants America to understand that the real heroes were those who died in the fight and those who risked everything to save her. Pat Tillman was a pro football player who gave up his career to serve in Iraq. He was killed by ‘friendly fire’ in the confusion of war. The truth about his death was only disclosed because his bereaved family would not give up. Pat Tillman’s younger brother, Richard, lashed back at politicians who said his dead brother was with God. Pat Tillman wasn’t religious, and piety did not console the family. A tribute to Lori Piestawa is here. She leaves a son and a daughter. The war continues in Afghanistan. It is being fought by ordinary men and women, our volunteer army. The people of Afghanistan have no choice to opt out as the war is on their own soil. There are heroes, there are survivors, there are cowards and liars in the fog of war. Unquestionably, we are asking great sacrifice of some Americans while the rest of us can forget altogether, except on days such as Memorial Day. If we are to support our troops we must recognize our service men and women and their families by supporting them in peace, even if that debt takes a generation to pay. When the war is over, we must not fail to include our veterans in the opportunity they so justly earned. It would be appropriate to have a bit of perspective and balance, whether or not you agree with the struggle in Iraq or Afghanistan. Firstly, American military men and women are NOT ordinary; they are extraordinary. certainly the best trained, most highly educated, best prepared, best led and equipped military this nation or probably any nation has ever fielded. The confusion you evidence seems to originate from a mix of policy that led and keeps us in the fight–the politicians from Bush to Obama; the realities of combat in the 21st Century, and the Americans on the ground. During the last really declared war, war declared by Congress, WW II, an average of 29,000 people died every day from 1939 to 1945. This does not even take into account the brutal attack of Japan on China before 1939. The horror of Nanking preceded Pearl Harbor, did i t not, just as did the Battle of Britain or the slaughter in Poland. Some fifty million people were slaughtered in World War II. You might also recall the slaughter of about 40,000 Americans every year right here in the U.S. from automobile accidents, mostly young people. The last iteration of the Iraq war, 2002-2011did take 4500 American lives and, indeed, whether this was worth the sacrifice is a legitimate question, but a question with an answer that will come from one’s own perspective. I do not believe the war in Iraq was worth one kid’s life and I have four family members that were part of that war and now the difficulty of Afghanistan, a war also undeclared by Congress. Afghanistan similarly does not meet my taste for war, but it is there and our kids are there, now because of Obama, not Bush. After all, Obama ran on the premise that Afghanistan was the real war, not Iraq, did he not. The imbalance that resulted from the toppling of Hussein led to the craziness of evil states such as Iran and Syria, now devouring their own. Hussein was a bulwark in his own evil way against other evils and our own self-interest as well as that of much else in the Middle East would have been better served leaving him in place. The root cause of these wars, the attack of 9/11 should not be forgotten. More people were killed by those attacks than were killed at Pearl harbor by the Japanese. We should have been satisfied with the massive retaliation that occurred and just left it at that. But instead, the quagmire began, and our soldiers pay the price every day, not the politicians who sent them there, Republican and Democrat. We need to leave, not waste another American life, or another dollar, but there will be another and perhaps greater price for leaving as well. Women will return to a life less than desirable, ignorance and corruption will triumph, and a bizarre religious intolerance will result in another attack right here, perhaps more devastating. I remember this incident very well and it was so typical of the media to pick out Jessica Lynch because she looked kind of like someone’s little sister.There was another female soldier captured in that group-she was Black and seemed a little older.IIRC a soldier named Fisher received the Silver Star(3rd highest award foe valor)in that situation.I thought Jessica Lynch handled it all very well with class. Female POW’s was a culture shock for Americans. During WW2 some military nurses were captured by the Japanese I believe.Maybe I’m thinking of British nurses. I have the highest respect for all men and women that serve our Country, they are amazing!